Ian Fraser of The Kings Ferry receives the award for Top Coach Operator of the Year after winning the Large Fleet Operator Award. David Steele of AGTO was awarded the Services to the Coach Industry Award. 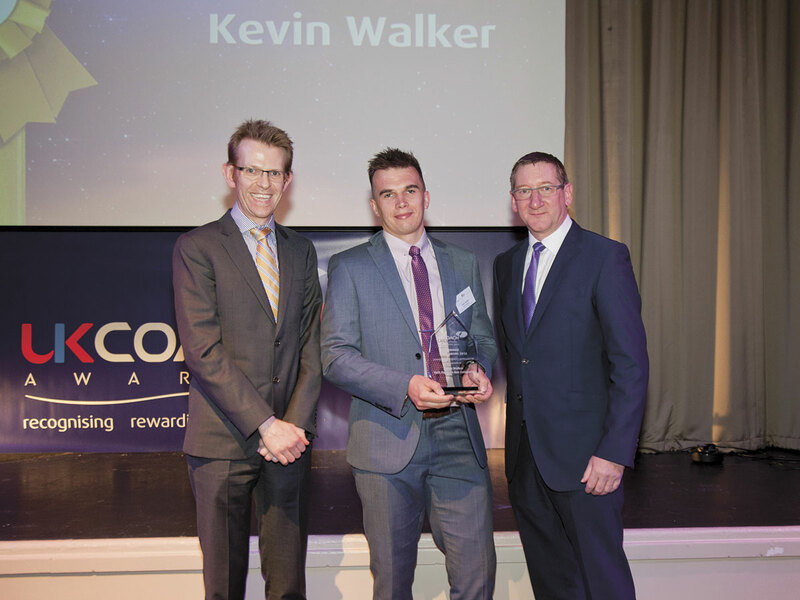 York Pullman’s Kevin Walker struck gold in the Young Coach Industry Professional category. 19 Year Old Sharron Meakin poses with her Unsung Hero Award. For the second consecutive year Anthony’s Travel won Top Small Fleet Operator. 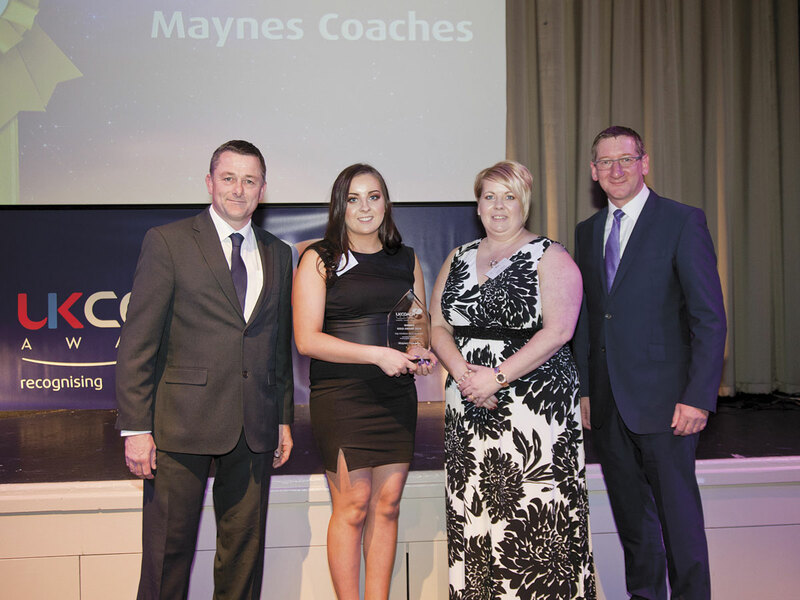 Buckie operator, Maynes Coaches, won Top Medium Fleet Operator. 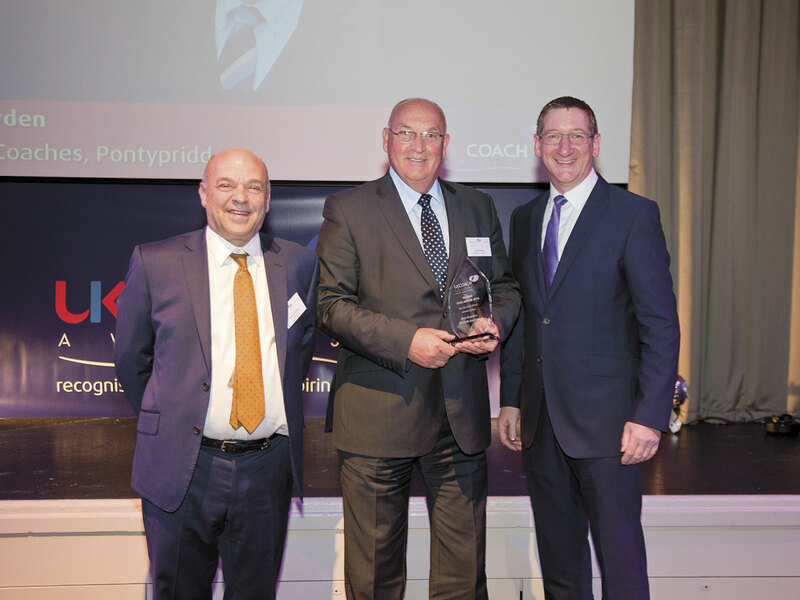 Glyn Bowden of Edwards Coaches, was crowned the Top UK Coach Driver. 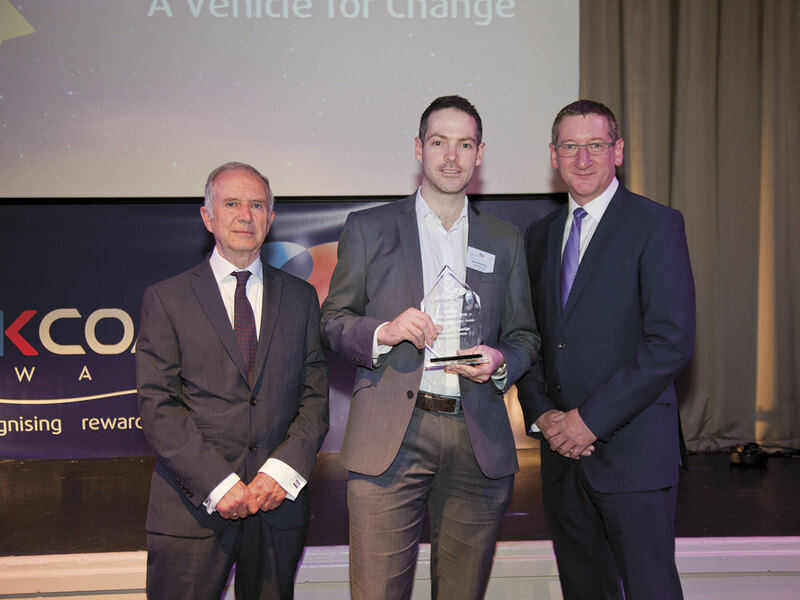 National Express scooped the top prize in the new category ‘Making Coaches a Better Choice’. Coach operators, suppliers and representatives of the coaching industry gathered to celebrate the best in the business at the prestigious industry awards, once again beautifully compared by BBC ‘Weathergirl’, Carol Kirkwood and ably assisted by Ian Luckett, chair of the CPT Coach Commission, who presented the awards. The evening began with an introduction from Allan Edmundson, Chairman UK Coach Awards. A video of Transaid’s Cycle Tanzania 2015 followed with details of next year’s challenge in South Africa. A collection for the charity raised almost £1600. This year saw a number of new categories, with 16 awards in total given out on the evening, cumulating, as always, in the much-revered accolade of Coach Operator of the Year. The new categories included, Coach Industry Website of the Year, Making Coaches a Better Choice – designed to recognise and reward projects, big or small, which genuinely improve life for coach operators, coach drivers and their passengers and Best Coach Industry Brand – to recognise excellence in branding over a sustained period, demonstrating how a strong and high-quality branding strategy, consistently applied over time, has driven business improvement and captured new customers. Fun seemed to be the theme of this year’s ceremony and a rolling quiz was interwoven throughout the evening’s presentations. The winner of the quiz donated their magnum of champagne prize to be auctioned for Transaid, raising £250. Rather than the traditional way of pulling out an envelope from the donations to the charity, an interactive game of heads and tails ensued where participating audience members chose hands on heads or hands on bottoms before the coin was flipped. A process of elimination determined the winning three participants. A mini casino took place in the foyer of the bar area and a photo booth, complete with dressing up box, proved very popular. Several operators were weighed down by their multi awards, including The Kings Ferry, who, in addition to the top prize, also took home three Silver Awards; for Coach Industry Website of the Year; the Coach Marketing Award and Head of Sales Ben Bhattal for the Young Coach Industry Professional Award. 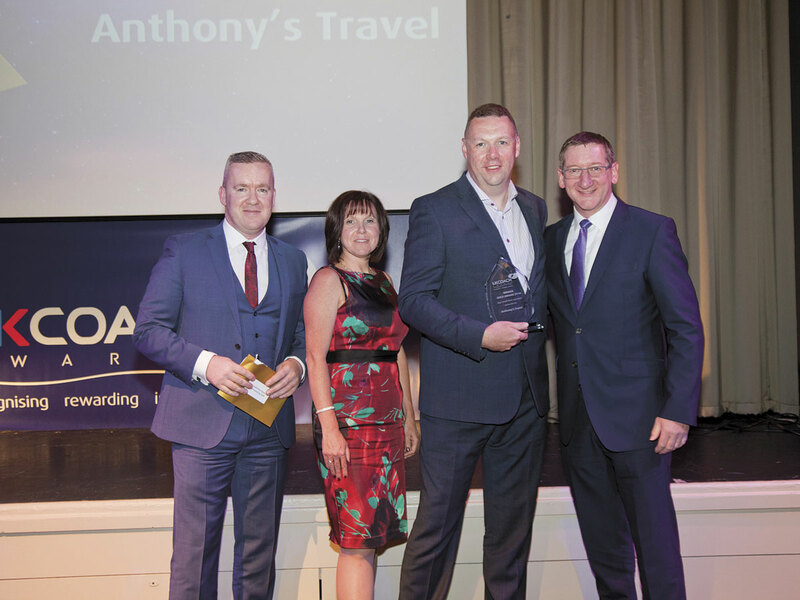 Anthony’s Travel of Runcorn were awarded Top Small Fleet Operator, for the second year in a row and also won gold in the ROSCO Award for Innovation in Road Safety, and Silver in the Best Coach Industry Brand category. 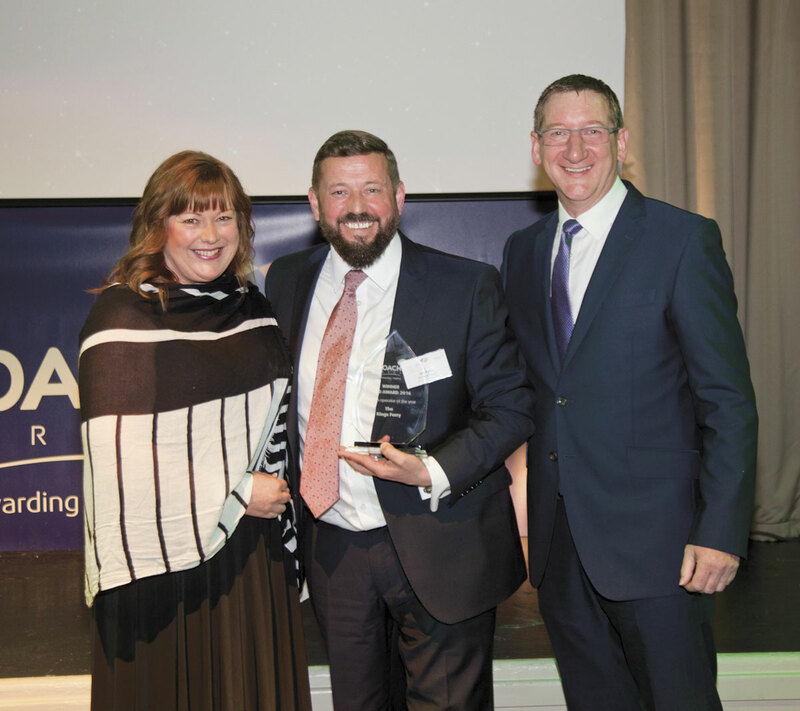 Shearings took home a Gold Award for the Industry Web Site of the Year, Silver in the Top Large Fleet Operator category and two Bronzes, in the Coach Marketing and Coach Travel Programme categories. Coach Marketing Award, sponsored by Bus and Coach Buyer; Winner, Gold Award: Bard On Board – Johnsons Coach and Bus Travel, Silver: The Kings Ferry, Bronze: Shearings Holidays. Finalists were Think globally act locally – Anthony’s Travel and Belle Vue Brokerage and Conference Event Transport Management – Belle Vue Manchester. Coach Industry Website of the Year, sponsored by Holiday Extras; Winner, www.shearings.com – Shearings Holidays, Silver: www.thekingsferry.co.uk – The Kings Ferry and Bronze: www.busybus.co.uk – BusyBus. Bury Market were finalists. The Customer Service Award, sponsored by Mistral was awarded to Rik Tapper of Belle Vue Manchester. Top Small Fleet Operator sponsored by EVM; Winner, Anthony’s Travel, Silver: Woods Travel, with Bronze to Carol Peters Travel. Safety Innovation sponsored by ROSCO was also awarded to Anthony’s Travel for their ‘Safety as standard’ programme. Making Coaches a Better Choice, presented by David Steele of AGTO (Association of Group Travel Organisers); Winner, A vehicle for change – National Express, Silver: RailAir – First Hampshire, Dorset and Berkshire, and Specially Commended: Nantwich Coach Welcome Scheme – Nantwich Town Council. 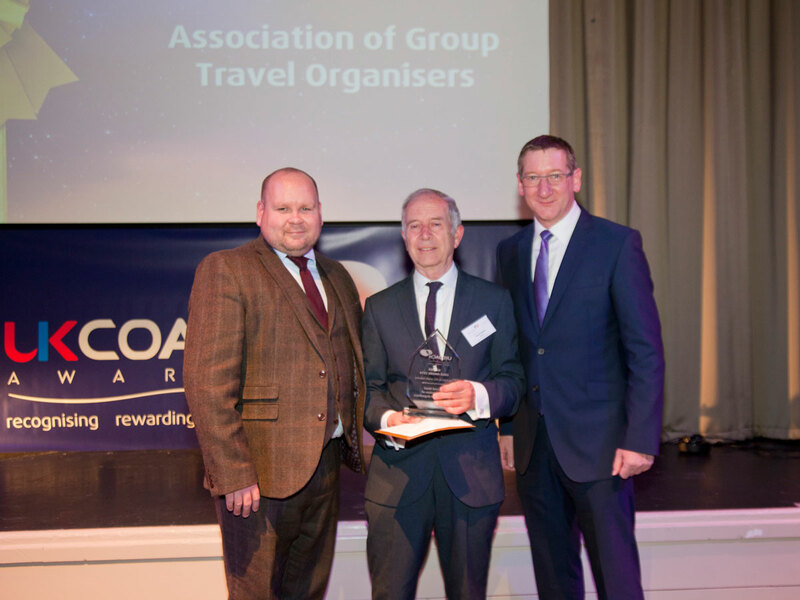 David then went on to receive the Services to the Coach Industry award, sponsored by Personal Group, in recognition of his campaigning work for coach tourism over a career dating back more than 40 years. Top Medium Fleet Operator, sponsored by Volvo and Thomas Hardie Commercials; Winner, Maynes Coaches of Buckie, Silver: Belle Vue Manchester, Bronze: Alfa Coaches, Chorley. Finalist was Crosskeys Coaches of Folkestone. 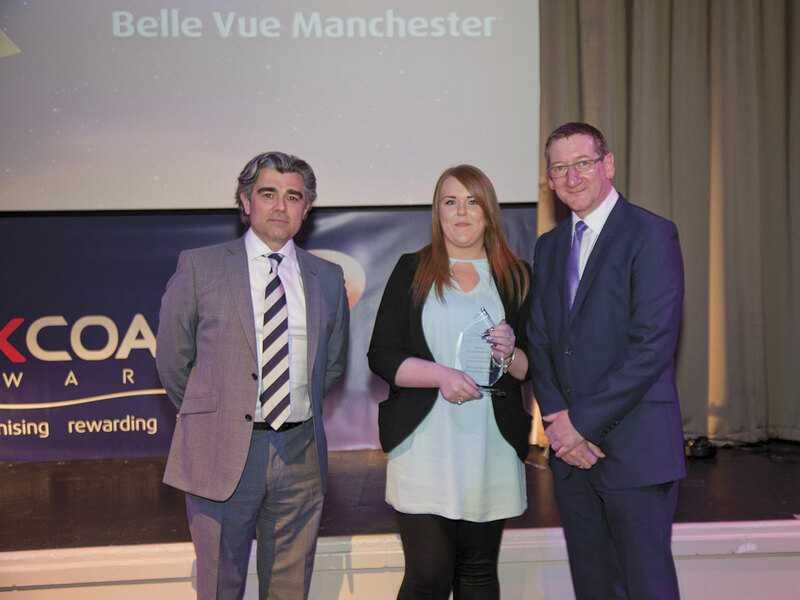 Unsung Heroes sponsored by Backhouse Jones; Winner: Shannon Meakin – Belle Vue Manchester. Specially Commended were Donna Thompson, also from Belle Vue and Steve Way of National Express. Coach Travel Programme sponsored by CBW/Group Travel World; Winner, AW Eastons Coaches, Silver: Edwards Coaches and Bronze: Shearings Holidays. Finalists were: Great Britain by Coach, Air and Sea – Epsom Coaches, 2016 Travel Programme – Gardiners NMC, Summer 2015 – Johnsons Coach and Bus Travel and UK and Continental Coach and Air Holidays – Woods Travel. Best Coach Industry Brand, sponsored by Bus and Coach Professional; Winner: Transport Suppliers to Education across Greater Manchester – Belle Vue Manchester, Silver: Brand Anthony’s – Anthony’s Travel and Bronze: BusyBus Holdings – BusyBus. Top Large Fleet Operator, sponsored by EvoBus; Winner: The Kings Ferry, Joint Silver went to Shearings Holidays and York Pullman Bus Company with National Express as a Finalist. York Pullman Bus Company finally struck Gold in the Young Coach Industry Professional Award, sponsored by CILT UK with Kevin Walker receiving the accolade. Silver went to Ben Bhattal – The Kings Ferry. Top Express Coach Operation, sponsored by Viva Blackpool; Gold went to Express City Connect from Stagecoach East Scotland whilst Silver was awarded to X90 service from the Oxford Bus Company. Top UK Coach Driver, sponsored by Traffilog, Winner: Glyn Bowden – Edwards Coaches, Silver: Brian Davis – Motts Travel, Bronze: John Gilbody – Belle Vue Manchester, Finalists were Mark Pierce – Anthony’s Travel and Steve Rudman – Cairngorm Travel. ‘Our awards provide people with a real boost: they know that they win because our independent, expert judges have chosen them from the best in the industry, and judged their nomination against objective criteria’.